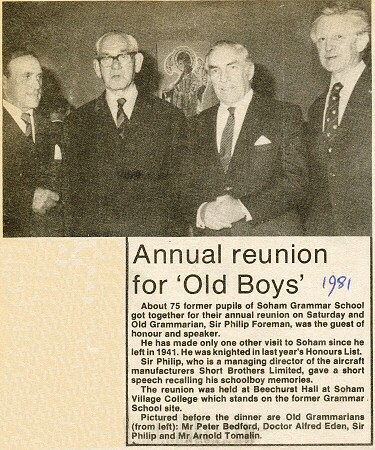 About 75 former pupils of Soham Grammar School got together for their annual reunion on Saturday and Old Grammarian, Sir Philip Foreman, was the guest of honour and speaker. He has made only one other visit to Soham since he left in 1941. He was knighted in last year's Honours List. Sir Philip, who is a managing director of the aircraft manufacturers Short Brothers Limited, gave a short speech recalling his schoolboy memories. The reunion was held at Beechurst Hall at Soham Village College which stands on the former Grammar School site. Pictured before the dinner are Old Grammarians (from left): Mr Peter Bedford, Doctor Alfred Eden, Sir Philip and Mr Arnold Tomalin. If you can add to this page please contact the editor.